The main building, formerly the old school house, was built about 1926 and served the community well until it closed in 1994. The building is currently on the NC Study List of Historic Places and hopefully will be listed on the National Register of Historic Places in the future. On-going renovation efforts have converted the abandoned building into a vibrant, thriving center of the community once again. 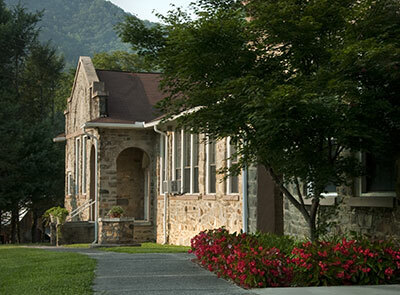 The building is home to many Center sponsored programs including the Appalachian Musicians after-school program, 21st Century Scholars funded after-school program, and the Stecoah Artisans Gallery. There is free wi-fi available in the building. The historic stage hosts the summer performing arts series An Appalachian Evening, Gospel Singings and other events. 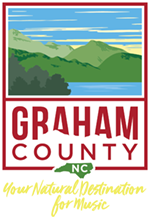 Graham Revitalization Economic Action Team (GREAT), and the Textile Studio also call the main building home. Certain portions of the main building, including the historic stage, may be leased for public or private events. Please call for more information on reserving areas of the main building. The sunny conference, meeting and banquet room seats up to 48 and is available to rent for meetings, classes, reunions, receptions or other private parties. All supplies, such as tablecloths, utensils, glassware and tableware, are also available for your event. Multiple-day use fees are negotiable. Call 828-479-3364 for rental rates. The property grounds include an outdoor pavilion, garden, family picnic areas and a children's play area. Also included on the grounds is a wonderful Native Azalea Garden. The azaleas, from the private collection of the late Sally DeGroot, bring outstanding beauty to the grounds in the early spring. The 10-acre property is surrounded by a paved and handicap-accessible 1/3-mile-long garden trail with rustic benches and native plants. The walking trrail is free and open to the public seven days a week. Restrooms are available during business hours. The pavilion and grounds may also be leased for private parties and events. Please contact Center staff for reservations and rates. The renovated old school cafeteria kitchen facility offers a new commercial kitchen that is available for public use. It is an NCDA inspected and Sanitation Graded facility featuring modern kitchen equipment and cooler or dry storage space. The kitchen may be used to prepare food for personal use, retail sale or catering purposes, make value-added agricultural products, teach or take a class, host your own party or a variety of other purposes.